Bluetooth wireless technology will be used to send messages to revellers' mobile phones in a bid to cut violent crime in Wrexham over Christmas. 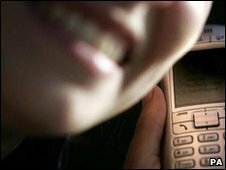 The messages will be sent as part of the Wrexham Community Safety Partnership's Call Time on Violent Crime campaign, now in its fifth year. T-shirts, radio advertising and jingles in a Wrexham club will also be used. Hannah Grew, of Wrexham's Liquid/Envy nightclub, said: "We embrace the campaign whole heartedly." People with Bluetooth capability will be able to receive the messages, which include reminders about responsible drinking, through their phones at certain venues on selected evenings. The technology was used at a Wrexham demonstration recently, and North Wales Police used it at the 2009 Eisteddfod. The Wrexham Safety Partnership consists of the police and ambulance services, Wrexham Council and other businesses and agencies. The campaign hopes to reduce alcohol-related and violent crime in the town centre. Staff at some pubs and clubs in the town will be wearing "Think B4U Drink - Know UR Limits" T-shirts. Wrexham town centre's police inspector, Alex Goss, said: "We want everyone to be safe and enjoy themselves in Wrexham over the Christmas period. "Our message is very clear; anyone behaving irresponsibly or violently will be dealt with quickly and efficiently. "Violence will not be tolerated in Wrexham. " Ms Grew said messages would be displayed on projectors. She added: "Having the biggest venue, we have the greatest capacity to get the promotional messages out." Ambulances across Wrexham and Flintshire will also be carrying posters displaying the campaign's message.